Voice of the Collector: USA Baseball is LIVE!! Stephen Strasburg and Bryce Harper. There are few bigger prospect names in The Hobby and they, and many others, are in the brand new USA Baseball. 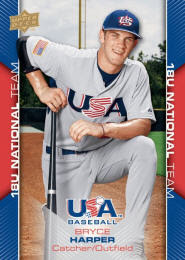 I have always appreciated this set if for no other reason that it helps fund various levels of Team USA Baseball. Print Run: ONLY 2,665 SETS PRODUCED! Upper Deck has pusted a HUGE, 84 picture gallery on their Facebook page. We really like the Team USA card design and premise, but when we bought our last hobby box of these it was rife with quality control problems and damaged cards, so, not to generalize or anything, but be forewarned that you may have to become acquainted with the customer service department. It's not live. It's been pushed back to the 18th.